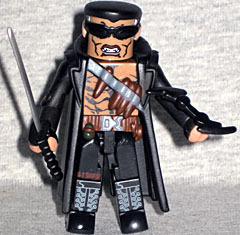 Not all the early Minimates sets have a logical connection between the figures, but this one seems to have been assembled intentionally. See if you can guess what they have in common before we reveal it at the end. 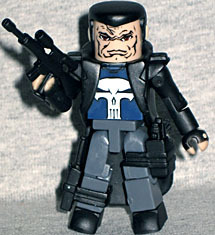 This is the second Punisher Minimate, but still the first in a lot of ways. It's the first available at mass retail (or at least as "mass" as specialty stores can be) and the first to have any accessories. You'll recall that the previous was an SDCC exclusive, but this one is just a normal part of Series 9. This is a Tim Bradstreet Punisher, with the scarred-up "old man" face and the weird skull on his blue shirt. He's wearing a trenchcoat, and is armed with a rifle, a knife and a pistol. The smaller weapons have their own holsters on his legs. The coat is actually designed to flow around the weapons, which is a wonderful attention to detail. Blade is a half-vampire, because his mother was bitten while she was pregnant. He originally dressed like a typical '70s Blaxploitation hero, complete with an afro and a short brown leather jacket. His wardrobe has been updated regularly over the years, and this is meant to be his 2000s version: trenchcoat, bare chest, and really cool fingerless gloves (Punisher gets the same ones, but they're still neat). The coat is a new piece and has never been reused - after all, who else is going to need a bandoleer full of wooden stakes? On the other hand, the utility belt introduced here has been seen many more times over the years. His weapons include a sword and a scabbard that plugs into his back, and a version of his glaive that can plug into the belt. His glasses are attached to his hi top fade, and the face beneath is wonderfully angry. His abs are almost ridiculously detailed, but the coat generally hides them. He's not meant to be displayed without it anyway: there are black stripes on his sides to blend in. By the time Assault Punisher and Blade came out, the C3 innovations had made their way to the normal series, so they both have Lego-holes in their feet and pegs to hold their hair on. Now, have you guessed what they have in common? Besides their coats, obviously. No, the reason these two were paired in this release was simply that they were both low-tier Marvel movie stars. 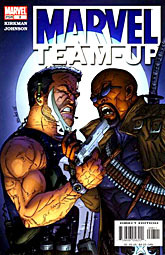 The first Punisher movie had come out a year before, and all three Blade movies were out by that point, as well. The two characters don't really have any connection in the comics, but "hey, these were both films" seems to be good enough reason to get us more fun toys. This entry was posted in Art Asylum, Marvel, MMMR and tagged Blade, Minimates, Punisher. Bookmark the permalink.